Edmonton drivers, cyclists and pedestrians are still not following the rules when it comes to the bike lanes downtown. Drivers are not consistently obeying signs prohibiting right turns over bicycle lanes in downtown Edmonton, the city and cyclists say. 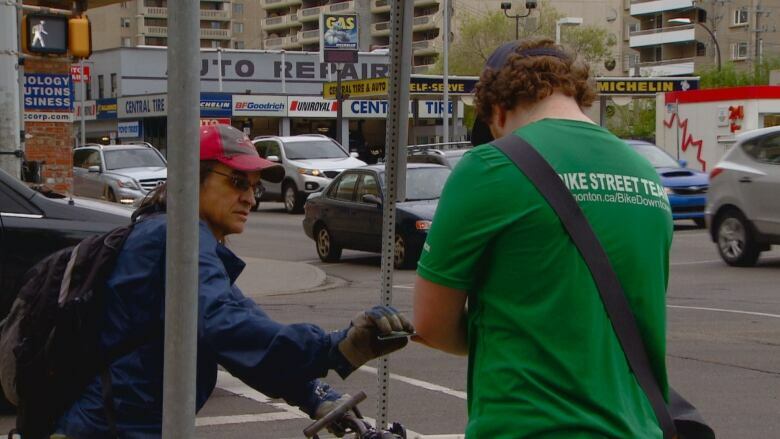 "The rules are put in place because vulnerable street users, both pedestrians and cyclists, can't be seen sometimes," said Molly Turnbull with the Edmonton Bicycle Commuters. For drivers turning right across a bike lane, it's difficult to see a moving cyclist headed for the intersection, she said. "The challenge is the no-right-on-red sign," said Megan Farrell, social marketing coordinator with the City of Edmonton. 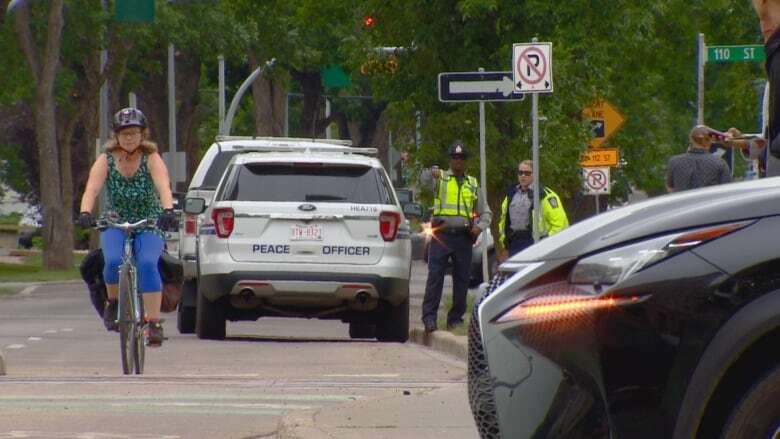 Edmonton police, peace officers and members of the city's bike-education street team converged on the intersection of 109th Street and 100th Avenue for an hour Tuesday morning stopping those ignoring the rules of the road. "It's important that all road users know how to safely navigate the network," Farrell said. The message to drivers is resist turning right on a red light, while cyclists need to know they have to stop at all red lights, she said. "A lot of cyclists tend to think that they don't have to obey the same rules of the road that vehicle drivers do, which is not the case," said Const. Dean Shwaga. Pedestrians must realize they have to yield to cyclists when crossing bike lanes, Farrell said. Segments of the network opened last year. "It's still pretty new to Edmonton and people who don't normally come downtown, they'll see quite a different landscape than what they've seen over a year ago," Shwaga said. While officers handed out warnings and leaflets Tuesday, they will be handing out tickets in the future, he said. The city's bike education street team will attend events across the city this summer to answer questions about the bike network, Farrell said. People with questions about the bicycle network can visit edmonton.ca/cycling or contact the city's call centre at 311, she added.